1962. LACE Complement of Units. 1949 The Navigational Projects Division of English Electric was set up at Luton under L. H. Bedford to design and build the Thunderbird ground to air missile for the British Army. 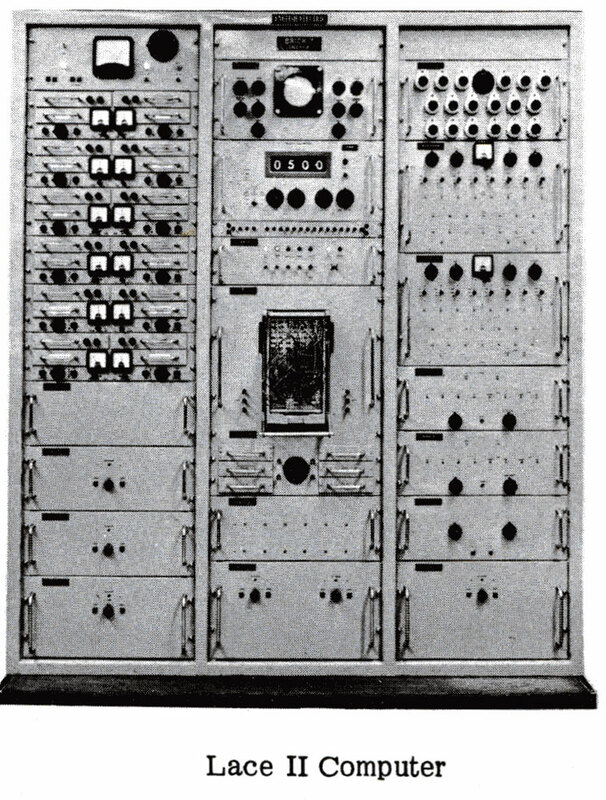 The first section to be set up was “the Simulator Section” under Dr R. W. Williams, which first built a number of fixed purpose simulators, then in 1955 started the design and build of the LACE series of analogue computers. 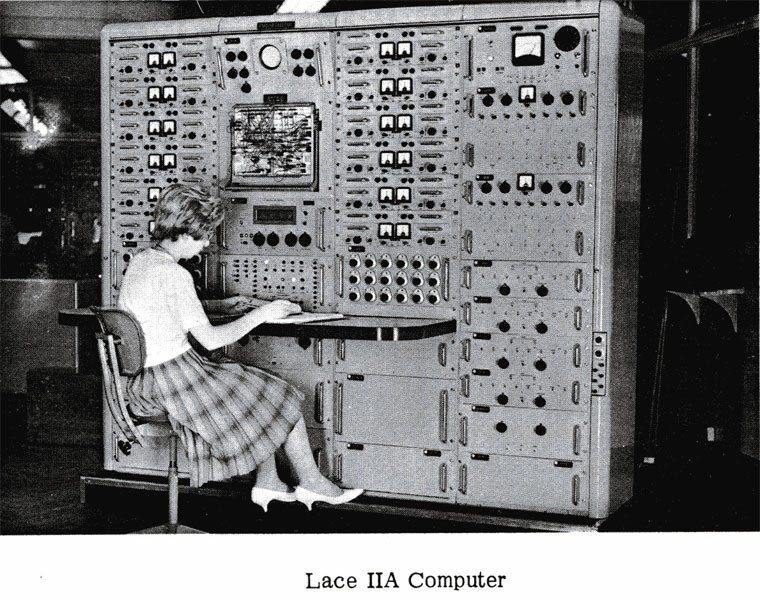 The 5 LACE MK1 computers came into service in 1956/7. Following this Luton works built a prototype LACE MK2, which was then engineered at the Kidsgrove works into a production build. Michael G. Brown was the Luton engineer liaising with Kidsgrove on the re-engineering. Luton, later Stevenage, had 8 of these machines and later still built 6 LACE MK2A, which had twice the capacity of the MK2. The MK2 was also used by Warton and Bristol but as a commercial venture it was unsuccessful. 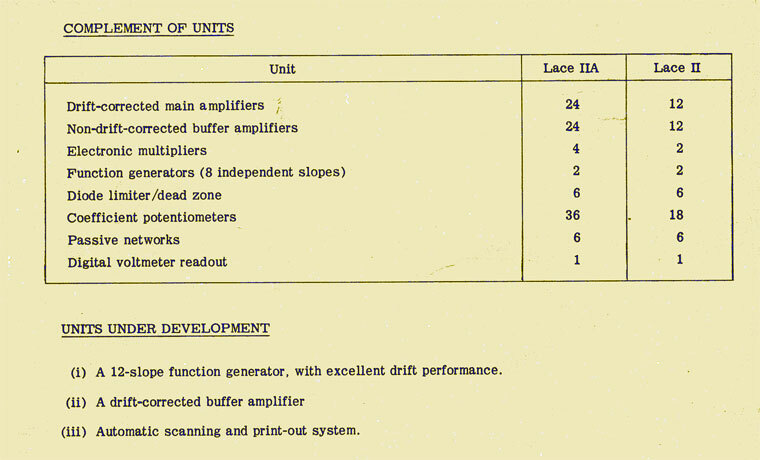 For further information on the LACE MK1 computer - see Electronic Engineering Vol 29 July 1957 pages 306-312, R. J. Gompertz and D. W. Righton, and Vol 29 August 1957 pages 380-385, J. C. Jones and D. Readshaw. This page was last edited on 1 February 2019, at 10:04.